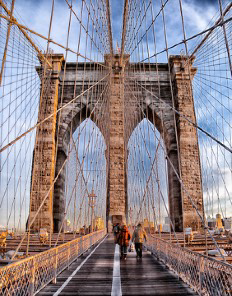 The Brooklyn Bridge | Custom & Private New York Tours, Inc. The icon of engineering and beauty in the 19th century! It was the tallest edifice on the continent connecting Brooklyn and Manhattan that forever changed both cities. The fascinating history, the tragedy and glory, the technology and characters that made it possible is yours to experience. We’ll take a ride over the bridge and venture into beautiful Brooklyn Heights. Why did P.T. Barnum march twenty elephants across the bridge? Once you know you’ll always remember, just like an elephant! We can traverse the bridge by car or foot if you wish. It’s approximately one mile.